(Source: VFXWorld) Pixar Animation Studios made three major product announcements to users of the studios’ Academy Award-winning RenderMan software and to every artist and studio creating cinematic quality imagery. The first announcement is unlimited threading across all RenderMan Products, the second is the upcoming release of RenderMan Pro Server 15.0, and the third is Tractor 1.0, Pixar’s new render management solution engineered for computing networks of unprecedented scale. Unlimited threading will enable studios and artists to maximize the power of their render farms, allowing each license of RenderMan to utilize any number of threads on the latest multi-core platforms. RenderMan Pro Server 15.0 will be the first product to introduce unlimited threading when it is released in the fall of 2009. This will be followed with unlimited threading for RenderMan Studio and RenderMan for Maya. The forthcoming RenderMan Pro Server 15.0 is a key component of Pixar’s core rendering technology and introduces several powerful new capabilities, including true volume primitives, major additions to the RenderMan Shader Language (RSL), Disney’s Ptex per face painted textures, imager shaders, an API for subdivision surfaces, and more. This release will also include significant performance enhancements for rendering production scenes, including optimized memory management and improved thread scalability. (Source: Variety) In an unusual move for Sony Corp., Sony Pictures Imageworks is taking five of Imageworks’ proprietary CG tools open-source. Open-source software is free to all and can be modified or improved by anyone. “Traditionally, in visual effects, the idea has been to have strategic advantage by using a lot of proprietary technology,” said Imageworks chief technology officer Rob Bredow. “It was appropriate for the development of this business, but as the industry is starting to mature, open standards and the ability to collaborate between companies is as important as competitive advantage,” he continued. (Source: AppleInsider) Just recently considered the king of handheld gaming, Nintendo is now sending an alert that it could be trouble over its next fiscal year as Apple’s iPhone and iPod touch might cut into its sales. Known equally for its DS handheld and its Wii console, the company said on Thursday that it anticipates its first profit decline in four years not only because of a rough economy playing havoc with game sales but also due to harsher competition in the portable arena stemming directly from Apple devices. (Source: MacRumors) Alongside today’s introduction of updated Time Capsule models, Apple appears to have finally discontinued Shake, its long-standing high-end digital compositing and visual effects software package. While Shake’s product pages remain available on Apple’s site, it is no longer listed in the online Apple Store and MacRumors has received word that Apple sales representatives have been informed of the product’s discontinuation. Shake had been priced at $499. Shake was originally launched in 1997 as a product of Nothing Real, which was acquired by Apple in early 2002. Apple continued to update Shake over the next several years, but the release of Shake 4.1 in mid-2006 was accompanied by the announcement that no further software updates were planned. A minor update to version 4.1.1 was issued in late 2008. (Source: TUAW) Sometimes, when I see something new, I have to smack myself in the head and think: “Why didn’t I think of that?” Remember the old V8 Juice commercials? I just heard about one of these and It’s the X-Power1 USB Rechargeable Battery Backup Cable from Xmultiple. It looks like a USB charging cable swallowed a AA battery. What’s inside is a lithium-ion battery with more capacity than built into any current iPhone or iPod. Using this cable, sync or charge your device while the internal cable battery charges. It will take about 3 hours to fully charge. Then when your device runs out of juice, plug in the cable and get power while you charge your device’s battery. I spoke with Alan Pocrass, the CEO of Xmultiple, and found that the information now circulating around the Internet is wrong. If you’ve already read something about the product, that information was based on a production prototype that will not be be built. The publicity picture is also inaccurate. The cable will work with iPhones, iPod touches and USB-charging iPods only, so earlier iPod owners (those that charge via Firewire) are out of luck. (Source: TUAW) Apple’s long-awaited free iDisk (iTunes link)program brings some great new features that makes MobileMe more appealing. But, there are a few holes and the program certainly doesn’t do everything. When you launch the iDisk app, you’ll see most of folders that you normally have access to in your iDisk, plus any other folders that you might have created. 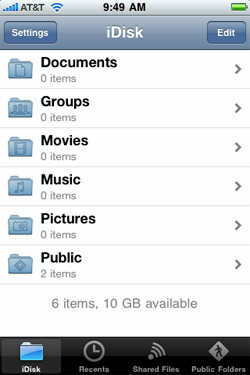 What you won’t see are the Backup, Sites, Software and Web folders that are normally in your iDisk. You can access these folders by enabling them through the software settings. Pressing the edit button will allow you to delete any user-made folders you’ve added to iDisk, but you can’t create new folders. Along the bottom are buttons for the iDisk itself, recent files viewed, files that you’ve chosen to share and public folders you’ve subscribed to. The settings screen is pretty basic, but leads to one of the gems of this piece of software — an extremely documented help section that goes over every aspect of the app. (Source: TUAW) The Eye-Fi Memory Card sends photos wirelessly from your camera to the destination of your choice, like a computer or the web. Back in January of ‘08, the product gained Mac and iPhoto support, and support for MobileMe was added in September ‘08. 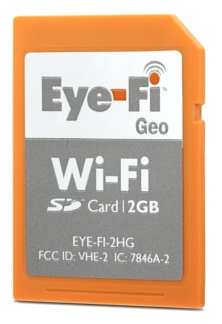 This week, Eye-Fi announced the Eye-Fi 2GB Geo, which is currently exclusive to Apple retail, both online and brick-and-mortar stores. As you’ve probably guessed, the Geo adds geotagging to the mix. Once snapped and tagged, photos will be sent to a folder on your Mac or directly to iPhoto, all tagged and ready to go. This makes great use of iPhoto ’09’s Places feature. It’s $60 for a 2GB card, which is cheaper that most of thegeotagging add-on hardware we listed a couple months back. If you pick one of these up, let us know how it goes. Additionally, there’s a Eye-Fi app for the iPhone [App Store link] that lets you send photos to your Mac or certain online services direct from your phone. 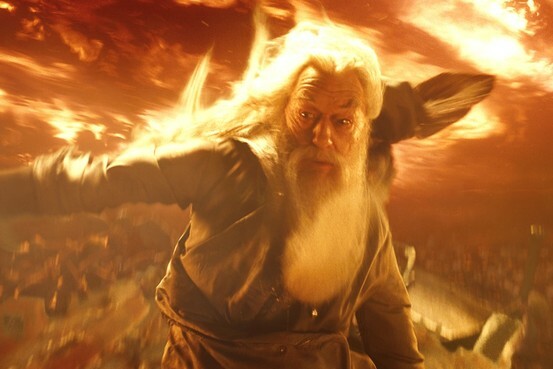 (Source: WallStreetJournal) In the film “Harry Potter and the Half-Blood Prince,” the wizard Dumbledore conjures up a tornado of fire that marks a new feat in animation — and a milestone for a breed of chips that are beginning to play broader roles in the computing world. The simulation was created by Lucasfilm Ltd.’s Industrial Light & Magic unit, which developed software that exploited the collective power of graphics chips from Nvidia Corp. in dozens of computer workstations. Special-effects houses ordinarily use those desktop machines to conceive and refine animation ideas, while hundreds of servers are used to render final images in a process that can take days or weeks. (Source: TUAW) Booyah is a company I’ve had my eye on for a while — they’re a couple of veterans from Blizzard Entertainment (makers of the popular Diablo and World of Warcraft games, two of my favorites) who have been teasing a big-time iPhone app. Just today, they’ve finally showed their cards, and have released Booyah Society, a 3D, interactive, social network-connected “achievement system for life.” If that sounds like an idea that’s pretty floaty, you probably heard it right.